In addition to normal SSB, candidates who have opted for the Flying Branch of the Air Force have to compulsorily undergo Pilot Aptitude Battery Test. This test is conducted at all the Air Force Selection Boards at Mysore, Dehra Dun and Varanasi. A candidate is allowed only one chance in his lifetime to appear for this test. Once a candidate is rejected, he is deemed to be permanently unfit for selection into the Air Force in the Flying Branch. Likewise, a candidate who passes PABT but fails in SSB need not appear again for PABT when he appears for SSB next time. You are shown pictures of six cockpit instruments, below which five statements are given. You are required to tick the correct statement which agrees with the readings of all the six instruments. There are 15 questions of this type, to be solved in 12 minutes. Let us now learn about the six instruments. As the name suggests, this instrument indicates the speed of the aircraft in the air. It is graduated in miles per hour or kilometres per hour or in knots. As shown in the diagram, it has a dial and a needle. The needle moves clockwise as the speed increases and it indicates the speed of the aircraft. Reading the instrument is exactly like that of the speedometer of a car. For example, in the diagram below, the ASI is indicating a speed of 150 knots. Be careful to read the speed accurately. This instrument provides two information. Firstly, it indicates whether the aircraft is flying level, climbing or descending. Secondly, if it is climbing or descending, the rate at which it is climbing or descending. The graduation of this instrument is in hundreds of feet per minute up or down. When the needle is at zero, the aircraft is in level flight. When the needle moves above zero, aircraft is climbing, and the rate of climb can be read against the scale. Likewise, when the needle moves above zero, aircraft is descending, and the rate of descend can be read against the scale. This instrument indicates the Altitude or the Height of the aircraft above the ground. As shown in the diagram, it has markings from 0 to 9 calibrated in feet, and has two needles. The big needle shows height in hundreds of feet and the small needle shows in thousands of feet. The instrument is to be read like a clock. For example, in fig (1) the altitude of the aircraft indicated is 7900 feet, and in fig (2), the altitude indicated is 1280 feet. Actually, in the altimeters fitted in aircrafts, there is also a third needle (as in the figures below) which indicates height in ten-thousands of feet. But for the purpose of PABT, only two needles will be represented and the third needle is not mentioned. This is also known as the Master-Instrument. It is the most important instrument as it provides a number of information regarding the flight of the aircraft. The upper half of the dial has a Bank indicator and is calibrated from 0 to 90 degrees on the right and 0 to 90 degrees on the left. The other parts of the instrument are- Horizon Bar and Model Aircraft. 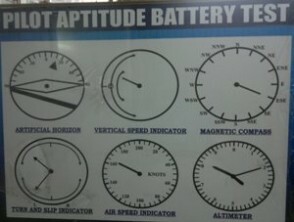 This instruments indicates the direction in which the aircraft is turning and also whether it is a balanced turn (i.e. is the bank proper). The upper half of the instrument has a pointer that indicates whether the bank is proper, less or more than required. The pointer shows the direction in which the aircraft is turning. The lower half of the instrument has a pointer which indicates whether a turn is to left or right. Also whether the turn is normal or sharp. If during a turn the top pointer is vertically up, it is a balanced turn. If during the turn both the upper an lower pointers are to the same side, the aircraft is over-turning is over-turning i.e. too much bank, and if the pointers are to the opposite side, the aircraft is under-turning i.e. the bank is not enough. Therefore in fig.1 below, the aircraft is turning right with proper bank and the turn is balanced. In fig.2, the aircraft is turning right with too much bank i.e. the aircraft is over-turning as the pointers are to the same side. In fig.3, the aircraft is turning right with not enough bank i.e. the aircraft is undertaking as the pointers are to the opposite side. This instrument indicates the direction (also known as heading) in which the aircraft is flying and is indicated by the needle on the dial. The dial is marked North, East, South, and West. The midpoint (45 degrees) between North and East will be called Northeast, and the midpoint (45 degrees) between East and South will be known as Southeast and so on. Likewise, the direction between North and Northeast will be called North Northeast (NNE) as it is closer to the North, and the direction between Northeast and East will be called East Northeast (ENE) as it is closer to the East, and so on. This phase will have only two cockpit instruments (Artificial Horizon and the Magnetic Compass) and, instead of five statements, five-three dimensional pictures will be displayed. The candidates are required to tick the correct pictures which agree with both the instruments. While solving this, the candidates are advised to first compare the pictures with magnetic compass and eliminate the ones that do not agree with the direction indicated by the compass. After short listing the pictures that agree with the magnetic compass, he must now compare them with the Artificial Horizon and tick the correct answer. Candidates must never try to first compare the pictures with the Artificial Horizon as it will be more time consuming. There will be 60 questions of this type which have to be answered in 20 minutes. You should remember that the aircraft going away from you in heading towards North and the one coming towards you is heading South. There is no reason for a candidate to feel under confident or confused with respect to PABT. The examiner conducting the tests will first explain all the instruments thoroughly and also give practice by solving examples before conducting the written tests. These tests are designed to ascertain whether a candidate has the qualities like concentration, good anticipation and reflexes, coordination of limbs and ability to carry out various tasks at the same time. These tests are also conducted in two phases. A candidate is made to sit in a cockpit like compartment with a computer screen in front of him. The screen has a one inch square marked at the centre of the screen. When testing starts, a moving spot light will appear on the screen. The candidate has control on the vertical and horizontal movement of this spot light with the help of the foot pedals and the stick provided to him. When the left foot pedal is pushed forward, the spot light will move to the left, and when the right pedal is pushed forward, the spot light will move to the right. Likewise, when the stick is pushed forward, the spot light will move down and when the stick is pulled backwards, the spot light will move up. When the test starts, the spot light will start moving on the screen. The candidate has to control the movement of the spot light with the help of the foot pedals and the stick and bring it inside the one inch square marked on the screen. The spot light will try to move out of the square, but the candidate must anticipate the movement and keep the spot light with in the square as long as possible with the help of the controls. Marks scored by the candidate will be proportional to the time he is able to keep the spot light within the square. It is like a computer game and the score obtained by the candidate will be indicated by the computer at the end of the test. The duration of each test is about 5 minutes. While controlling the spot light, the candidate is also expected to monitor and take appropriate action on other happenings around him. Below the screen in front of him, there are 2 lights which will come ON at intervals and remain on for 3 seconds if not switched off. Whenever any of the lights come ON, the candidate is expected to put it off with the help of a handle provide on the left side. The left light can be put off by moving the handle forward and then bringing it to the original position. Likewise, the light on the right side can be put off by moving the handle backward and then bringing it to the original position. The candidate will not get any mark for any delay in putting off the lights within 3 seconds. While doing the tests, candidates will be wearing ear phones and through these, a faint sound will transmitted at frequent intervals. Whenever the audio is detected, the candidate has to cancel (put off) the same by pressing the button provided on the stick within 3 seconds. It can be seen that the tests are meant to determine whether a candidate has reflexes and can concentrate on various activities at the same time. The main objective for the candidate must be to keep the spot light within the square as long as possible. Putting off the lights and cancelling the audio are only meant to divert the attention of the candidate from the main screen. Therefore the candidate’s priority must be to keep his eyes focused on the computer screen and concentrate on controlling the spot light, and should switch off the lights and audio without removing the eyes from the main screen. The duration of the test is for about five minutes. A candidate is given three chances, i.e., tested three times, and only his best score is considered. The second test is a simple test to determine whether a candidate has anticipation and coordination of limbs. The candidate is made to sit in a chamber as before, and there will be a computer screen in front of him. On the screen, there will be a spot light and a track with curves and bends like a road. The horizontal movement of the spot light can be controlled by a stick provided to him. When the stick is moved to the left the spot light will move to the left, and likewise, a movement of the stick to right will move the spot light will move to the right. When the test starts, the track on the screen will start moving down and the candidate will get the impression of moving along a road (like in a computer game). With the help of the stick he has to control the spot light and keep it along the curves of the track without letting it leave the track. It is like driving a car along a road. Longer the spot light moves along the track, the more marks he is able to score. He will be penalized in terms of marks if the spot light leaves the track. The duration of the test is for about three minutes. A candidate is given three chances, i.e., tested three times, and only his best score will be considered.